“This is a huge win for all Californians—and a huge loss for Monsanto—as it upholds our right to protect ourselves and our environment from unnecessary and unwanted exposure to the dangerous chemical, glyphosate,” said Adam Keats, senior attorney at CFS. Glyphosate is a broad spectrum herbicide that is widely used in agriculture, parks, home gardens, and residential landscapes. It is the most heavily used pesticide in the world, in large part due to the proliferation of Monsanto’s genetically engineered Roundup Ready crops that are resistant to glyphosate. In 2015, the International Agency for Research on Cancer (IARC) of the World Health Organization (WHO) concluded that glyphosate is “probably carcinogenic.” California subsequently issued the notice of intent to list glyphosate as a Proposition 65 chemical based on the IARC finding. 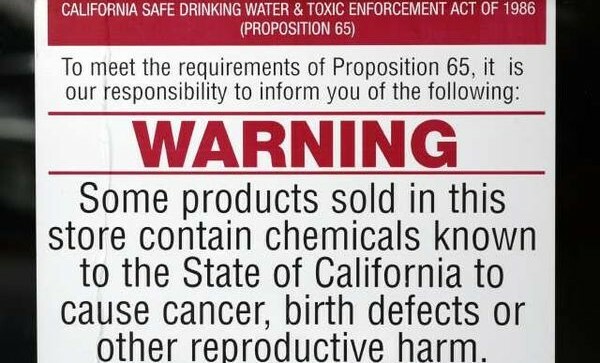 Under Proposition 65, no person in the course of doing business may knowingly or intentionally expose any individual to a chemical known to the state to cause cancer or reproductive toxicity without first giving a clear and reasonable warning. The discharge of such chemical into a source of drinking water is prohibited. With today’s court ruling, these protections will now be required for glyphosate products. Even worse: Glyphosate is also an Endocrine Disrupter – – meaning that it triggers excess estrogen (female hormone) production in the body. Maybe the fact glyphosate is now showing up in vaccines will allow a Prop 65 warning on them? Would California dare? Then they can then also include the other toxins to strengthen the case.